Very often I get asked how I prepare for an Ironman and how much training time I invest on a weekly basis. 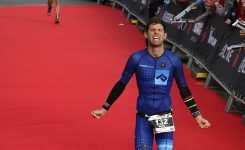 I want to give you a few insights into how I prepare for my next Ironman in Italy in 6 weeks time. It will be my last race of the season and my ambitions for this race are very high. My big goal is to qualify for the Ironman World Champs in Kona. So yeah, it’s a very though and difficult goal but without a challenging goal, it’s difficult to grow and get better as an athlete. With that goal in mind, my training looks slightly different to let’s say my first Ironman, where my goal was to finish in a respectable time. Why 9hrs? Well usually on a fast course, which Italy seems to be, is the time where you have pretty good chances to secure a slot and make it into the top 5 in your age group. It’s sounds crazy, 9hrs for an Ironman as an amateur! And yes, I agree it is. The level even in amateur triathlon races is ridiculous high. Let’s dig into this 3 aras a bit more. My bike training is heavily focused on strong hill riding, good form and managing the terrain. These are key components in order to execute a strong bike split in an Ironman. The stronger I am on the bike, the more likely it is to run off the bike well. Usually I do at least 3 ride a week. One ride, which is usually on an indoor trainer, focuses purely on end of range work. This means very low cadence (<50rpm) with big gears or very high cadence (100rpm+) on smaller gears. These are usually executed at or above threshold level. So very challenging on the nuromuscular and cardiovascular system. The 3rd ride is also usually endurance based but shorter in duration but also with some strength elements included. The 4th ride is purely for recovery purpose with very low intensity. The next focus is on Strength training. This is a very important component throughout the season, and also during race season. I do 2 strength sessions per week. Both of these sessions are very functional and focus on whole body big compound movements. The last component in every training session is mobility work and training of specific weak areas (ankle and hip mobility e.g.) The training sessions do last for about 45mins. The last focus is on Running to build resiliance. I don’t do much speed work or running above threshold level. I usually do 3-5 runs per week. 1 run is focused on form and endurance. It’s low stress and tempo but with a very specific focus on good form and posture. These are challenging runs as you need to be fully focused and aware of your running form to execute well. The 2nd run is usually some sort of strength focused run. A combination of strong hill repeats combined with good form running. These are difficult and very challenging as they put stress on both the neuromuscular and cardiovascular system. The 3rd run is a brick run. I do at least 1 brick run per week, usually after my long bike ride. The 4th run is shorter in duration but again with a specific focus on form and Ironman pacing. The last run is optional and is usually for recovery purpose only. In addition to the bike, run and strength training I swim at least 2 but mostly 3 times a week. The swim sessions are endurance based, coupled with some shorter but more intense speed work. At this time of the year I do not do any specific technique drills. It’s purely strong and sustainable swimming. The swim focus has moved a little bit in the background here as my focus has shifted more towards the bike and run at this time of the year. To put numbers against my training week is difficult as it varies a lot. But usually I train on higher volume and intensity for 2 weeks and then take 1 week of recuperation and lower stress work. For tracking my training progress I use TrainingPeaks which gives me good insights into my training over the course of multiple seasons. Volume or distance is not that important and doesn’t tell much if you train well enough for a race.For me it’s the intention of each training session. I don’t have a lot of sessions where I just train for the sake of training. Every session has a specific purpose and it’s how you engage in each session. It’s very tough and challenging to find the right balance of training smart and hard enough without putting yourself in a big rabbit hole of fatigue and over training. The ultimate goal is to arrive fresh and fit at a race! I have learned quite well to deal with fatigue and knowing when to push through and when to back off. But again, it’s difficult and an art that you need to learn and tailor to your needs. Everyone operates and absorbs training load differently, so it’s important to find out what works good for you and helps you to adapt to the training to become better. That’s why I am not a big fan of training plans that work for athlete X. Or to adopt to a training regime of a Pro athlete. My training integrates well in my life and the other commitments that I have. Obviously during the last weeks of an Ironman training, my priorities shift and training takes the front seat. So quite often during this time my social life is non existing and my attention and energy is on the race preparation. On a site note: If you want to take your training to the next level, I can highly recommend to hire a coach that helps you achieving your goals. Since having a coach myself for the second season now, I can relate to it much more and the benefits it has brought. I have developed as an athlete, learned so much on the way and have improved in the sport of triathlon.